The real-estate startup WeWork is recruiting for a new startup incubator called Area 51 Paradise Ranch, Wired reported. The company will test the incubator at its Tribeca office space in New York, the report said. The invite-only incubator will give startups a modern workspace and mentorship in exchange for a monthly fee – not equity. The real-estate startup WeWork is readying a new startup incubator, called Area 51 Paradise Ranch, that it will test at its Tribeca office space,Wired reported on Monday. 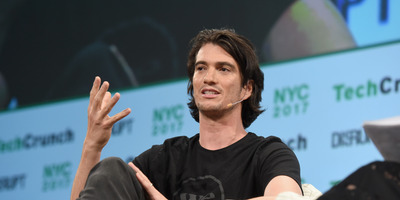 WeWork declined to comment on the new incubator, and the scope of the company’s long-term ambitions for the venture is still unclear. The coworking startup has raised eyebrows over the past year as its valuation has climbed. It reached $US20 billion in July, making it New York City’s most valuable startup and spurring several acquisitions. In just the past few months, the company has set out on an ambitious spending spree, purchasing the networking site Meetup for $US200 million, a mobile communications app, a coding camp in New York, as well as sleek new downtown headquarters. Area 51’s pitch deck, included in Wired’s report, describes the incubator as a “fluid yet systematic platform” that will foster “pioneers, inventors, and leaders” – an extension of its WeWork Labs. But Area 51’s approach will differ from that of other prominent incubators like Y Combinator, where startups trade a stake in their company’s equity for a modern workspace and mentorship. Instead, Area 51 will rely on WeWork’s business model: providing space and community for a flat monthly fee. According to Wired, there’s no promise of a WeWork investment or equity stake. Incubators are famously tricky business because of the unpredictable nature of determining a successful startup – but given its past successes, WeWork might prove a fierce competitor.